You can use http://nl.babelfish.yahoo.com/translate_txt to translate russian to english. Aahhhh, thát must have been the painting I had in mind when using that tiny table thingy at events recently. One mystery of 'on what piece of art did I see that!? * solved! Thanks! 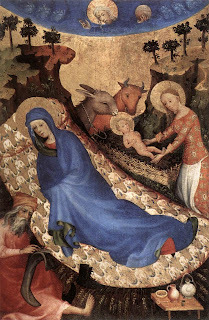 I like that painting too, but because of the sleeping guards, including the one with the belt coming from below his iron hat on his back, a typical detail from these 1390-1410 decades it seems.